More from Tantalus’ storeroom and Rachel’s excellent food/life blog dropped into my inbox this week (reblogging below). 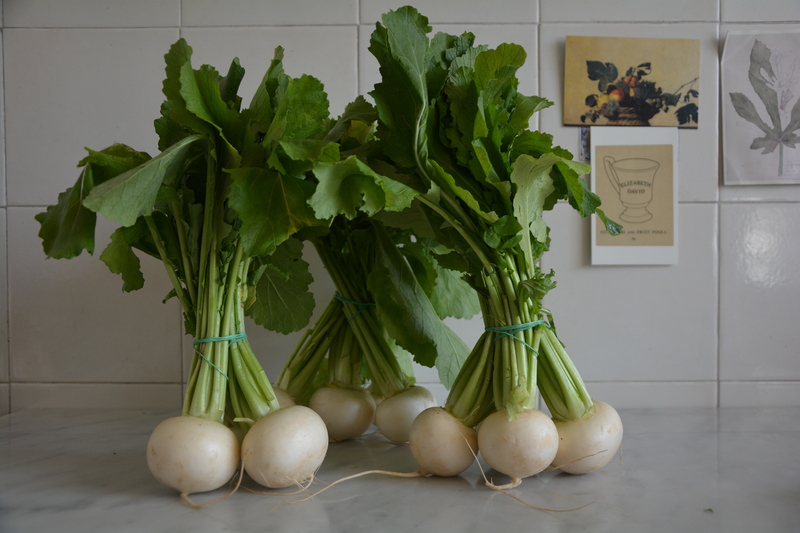 ‘Oh dear‘ said a friend when I told her I’d been asked to write about turnips. ‘Does anybody actually like them?’ I was about to say I do, but she was off on a beetroot and radish tangent before changing the subject entirely, so I just nodded. Afterwards it crossed my mind she was probably referring to the early winter variety, stout, purple-tinged turnips which, if left too long, can become stringy and harsh, which is where the ridicule comes in I suppose. ‘What is the difference between turnip and snot, children will eat snot‘ was the joke the naughtiest boy in the class told us in the playground. We rolled about laughing until our seven-year-old sides hurt. The giggles were carried into the school dining room, where waterlogged turnips mashed with carrots and cheap margarine were shunted around our plates.